For other uses, see Rip Van Winkle (disambiguation). "Rip Van Winkle" is a short story by the American author Washington Irving, first published in 1819. It follows a Dutch-American villager in colonial America named Rip Van Winkle who falls asleep in the Catskill Mountains and wakes up 20 years later, having missed the American Revolution. 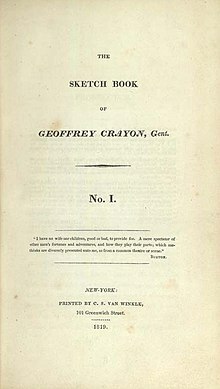 Irving wrote it while living in Birmingham, England, as part of the collection The Sketch Book of Geoffrey Crayon, Gent. The story is set in New York's Catskill Mountains, but Irving later admitted, "When I wrote the story, I had never been on the Catskills." "Rip Van Winkle" is set in the years before and after the American Revolutionary War in a village at the foot of New York's Catskill Mountains where Rip Van Winkle, a Dutch-American villager, lives. One autumn day, Van Winkle wanders into the mountains with his dog Wolf to escape his wife's nagging. He hears his name called out and sees a man wearing antiquated Dutch clothing; he is carrying a keg up the mountain and requires help. Together, the men and Wolf proceed to a hollow in which Rip discovers the source of thunderous noises: a group of ornately dressed, silent, bearded men who are playing nine-pins. Van Winkle does not ask who they are or how they know his name. Instead, he begins to drink some of their liquor and soon falls asleep. When he awakens on the mountain, he discovers shocking changes: his musket is rotting and rusty, his beard is a foot long, and his dog is nowhere to be found. He returns to his village, where he recognizes no one. He arrives just after an election, and people ask how he voted. 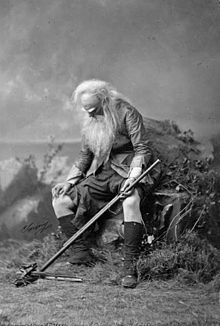 Never having cast a ballot in his life, he proclaims himself a faithful subject of King George III, unaware that the American Revolution has taken place, and nearly gets himself into trouble with the townspeople until one elderly woman recognizes him as the long-lost Rip Van Winkle. King George's portrait on the inn's sign has been replaced with one of George Washington. Van Winkle learns that most of his friends were killed fighting in the American Revolution. He is also disturbed to find another man called Rip Van Winkle; it is his son, now grown up. Van Winkle also discovers that his wife died some time ago but is not saddened by the news. He learns that the men whom he met in the mountains are rumored to be the ghosts of Henry Hudson's crew from his ship, the Halve Maen. He also realizes that he has been away from the village for at least 20 years. His grown daughter takes him in and he resumes his usual idleness. His strange tale is solemnly taken to heart by the Dutch settlers, particularly by the children who say that, whenever thunder is heard, the men in the mountains must be playing nine-pins. Rip Van Winkle A henpecked husband who loathes "profitable labor"; and a meek, easygoing, ne'er-do-well resident of the village who wanders off to the mountains and meets strange men playing nine-pins. Dame Van Winkle Rip Van Winkle's cantankerous and nagging wife. Rip Van Winkle, Jr. Rip Van Winkle's ne'er-do-well son. Judith Gardenier Rip Van Winkle's married daughter; she takes her father in after he returns from his sleep. Derrick Van Bummel The local schoolmaster who went on to serve in American Revolution as a flag officer and later a member of Congress. Nicholas Vedder Landlord of the local inn where menfolk congregate. Van Schaick The local parson. Jonathan Doolittle Owner of the Union Hotel, the establishment that replaced the village inn. Wolf Van Winkle's faithful dog, who does not recognize him when he wakes up. Man carrying keg up the mountain The ghost of one of Henry Hudson's crew members. Ninepin bowlers The ghosts of Henry Hudson's crewmen from his ship, the Half-Moon; they share purple magic liquor with Rip Van Winkle and play a game of nine-pins. Brom Dutcher Van Winkle's neighbor who went off to war while Van Winkle was sleeping. Old woman Woman who identifies Van Winkle when he returns to the village after his sleep. Peter Vanderdonk The oldest resident of the village, who confirms Van Winkle's identity and cites evidence indicating Van Winkle's strange tale is true. Mr. Gardenier Judith Gardenier's husband, a farmer and crabby villager. Rip Van Winkle III Rip Van Winkle's infant grandchild; his mother is Judith Gardenier. It is not explained why he is named for his maternal grandfather instead of his father. First installment of The Sketch Book of Geoffrey Crayon, Gent. included "Rip Van Winkle"
After a failed business venture with his brothers, Irving filed for bankruptcy in 1818. Despondent, he turned to writing for possible financial support, although he had difficulty thinking of stories to write. He stayed in Birmingham, England with his brother-in-law Henry Van Wart. The two were reminiscing in June 1818 when Irving was suddenly inspired by their nostalgic conversation. Irving locked himself in his room and wrote non-stop all night. As he said, he felt like a man waking from a long sleep. He presented the first draft of "Rip Van Winkle" to the Van Wart family over breakfast. "Rip Van Winkle" was one of the first stories Irving proposed for his new book, The Sketch Book of Geoffrey Crayon, Gent. Irving asked his brother Ebeneezer to assist with publication in the United States. As Irving wrote, "I shall feel very anxious to hear of the success of this first re-appearance on the literary stage – Should it be successful, I trust I shall be able henceforth to keep up an occasional fire." 2,000 copies of the first octavo-sized installment, which included "Rip Van Winkle", were released on June 23, 1819, in Baltimore, Boston, New York, and Philadelphia, published by Cornelius S. Van Winkle, and sold at a somewhat expensive 75 cents. A British edition was published shortly afterward, by John Miller, who went out of business immediately thereafter. With help from his friend Walter Scott, Irving was able to convince John Murray to take over British publication of the Sketch Book. Following the success of Rip Van Winkle in print and on stage, later celebrated editions were illustrated by Arthur Rackham (Heinemann, 1905) and N.C. Wyeth (McKay, 1921). In the tenth chapter of his book Lives and Opinions of Eminent Philosophers, the third-century AD Greek historian Diogenes Laërtius relates the story of the legendary sage Epimenides of Knossos, who was said to have been a shepherd on the island of Krete. One day, Epimenides followed after a sheep that had wandered off and, after becoming tired, went into a cave under Mount Ida and fell asleep. When he awoke, he continued searching for the sheep, but could not find it, so he returned to his father's farm, only to discover that it was under new ownership. He went home, only to discover that the people there did not know him. Finally, he encountered his younger brother, who had become an old man, and learned that he had been asleep in the cave for fifty-seven years. According to the different sources that Diogenes relates, Epimenides lived to be 154, 157, or 299 years old. Multiple sources have identified the story of Epimenides as the earliest known variant of the "Rip Van Winkle" fairy tale. In Christian tradition, there is a similar, well-known story of "The Seven Sleepers of Ephesus", which recounts a group of early Christians who hid in a cave circa 250 AD, to escape the persecution of Christians during the reign of the Roman emperor Decius. They fell into a miraculous sleep and woke some 200 years later during the reign of Theodosius II, to discover that the city and the whole Empire had become Christian. This Christian story is recounted by Islam and appears in a famous Sura of the Quran, Sura Al-Kahf. The version recalls a group of young monotheists escaping from persecution within a cave and emerging hundreds of years later. In Judaism, there is the story of Honi ha-M'agel, a miracle-working sage of the 1st century BC, who was a historical character but to whom various myths were attached. One of them recounts that Honi was journeying on the road and he saw a man planting a carob tree. He asked him, How long does it take (for this tree) to bear fruit? The man replied, Seventy years. He then further: asked him: Are you certain that you will live another seventy years? The man replied: No. But I am planting this not for myself, but for the other generations to come after me and the generations to follow those. Honi then shrugged as he walked away from the man. Later that day, he sat down to take a rest. But he had not rested for a usual amount of time. He had rested for seventy years, and rocks had formed a tent-like structure around him. When he woke, he saw a man picking a tree with carobs all over it. He asked, Are you the man that planted this tree? The man replied, No. But my grandfather planted it for me. And my father told me that his father planted this tree for me. The story of "Rip Van Winkle" itself is widely thought to have been based on Johann Karl Christoph Nachtigal's German folktale "Peter Klaus", which is a shorter story set in a German village. It tells of a goatherd named Peter Klaus who goes looking for a lost goat. He finds some men drinking in the woods and, after drinking some of their wine, he falls asleep. When he wakes back up, twenty years have passed. In many ways, the story is a classic European faerie tale of a man who is actually rewarded for helping the faeries move their barrel. They advance him to a time in life where he is free of his nagging wife and is now old enough for it be respectable for him to take it easy and play with children, working when he wants to instead of when he has to, supported by his loving, grown children. The theme of independence is also explored; the young Van Winkle lives in British America and is a subject of the King; the old Van Winkle awakes in a country independent of the Crown. On a personal level, the awakened Van Winkle has gained another form of "independence": being widowered from his shrewish wife. In Orkney, there is a similar folktale linked to the burial mound of Salt Knowe, adjacent to the Ring of Brodgar. A drunken fiddler on his way home hears music from the mound. He finds a way in and finds the trowes (trolls) having a party. He stays and plays for two hours, then makes his way home to Stenness, where he discovers 50 years have passed. The Orkney Rangers believe this may be one source for Washington Irving's tale because his father was an Orcadian from the island of Shapinsay and would almost certainly have known the story. In Ireland, the story of Niamh and Oisin has a similar theme. Oisin falls in love with the beautiful Niamh and leaves with her on her snow white horse, bound for Tir Na nOg – the land of the ever-young. Missing his family and friends, he asks to pay them a visit. Niamh lends him her horse, warning him never to dismount, and he travels back to Ireland. But 300 years have passed; his family and fellow warriors are all dead. When Oisin encounters some men trying to move a boulder, he reaches down to help them, the girth of the horse's saddle snaps, and he falls to the ground. Before the watching eyes of the men, he becomes a very, very old man. Author Joe Gioia suggests the basic plot strongly resembles, and may have originated with, an upstate New York Seneca legend of a young squirrel hunter who encounters the mystic "Little People", and after a night with them returns to his village to find it overgrown by forest and everyone gone: that single night had lasted a year. The story also bears some similarities to stories from east Asia, including the third century AD Chinese tale of "Ranka", as retold by Lionel Giles in A Gallery of Chinese Immortals, and the eighth-century Japanese tale "Urashima Tarō". The Hindu story of Muchukunda from the Bhagavatam also displays many similarities to the story of "Rip Van Winkle". The theme is taken up in numerous modern works of Science Fiction. In H.G. Wells's The Sleeper Awakes, a man who sleeps for two hundred and three years wakes up in a completely transformed London where he has become the richest man in the world. In the original Buck Rogers book, the protagonist falls asleep under the influence of a gas in a mine, sleeps for four centuries and wakes to find America under the rule of Mongol invaders - whereupon he places himself at the head of the freedom fighters. Einstein's Theory of relativity, under which a person traveling at near light speed would experience only the passage of a few years but would return to find centuries had passed on Earth, provides a broad new scope to express essentially the same literary theme - for example, in the opening chapter of Ursula Le Guin's Rocannon's World. In Robert Heinlein's Time for the Stars, Earth sends out a fleet of relativistic ships to explore the Galaxy, their crews hailed as stalwart pioneers - but after a century, which they experience as only a few years, Faster Than Light ships are developed and the earlier ones are recalled, their crews discovering that they had become unwanted anachronisms on a changed Earth. The protagonist notices a newspaper headline disparagingly announcing the arrival of himself and his shipmates as "yet another crew of Rip Van Winkles". The story has been adapted for other media for the last two centuries, in cartoons, films, stage plays, music, and other media. Actor Joseph Jefferson performed various dramatizations of the character on the 19th-century stage. He and Dion Boucicault wrote an adaptation which opened in London in 1865 and on Broadway in 1866. In 1896 Joseph Jefferson filmed a series of short films recreating scenes from his stage adaptations, which are collectively in the U.S. National Film Registry. Several other film adaptations have been produced. George Frederick Bristow composed 1855 an opera entitled Rip van Winkle. In 1882 Robert Planquette and H.B. Farnie premiered a romantic opera adaptation. The 1960s Tale Spinners For Children record series included a dramatization of the "Rip Van Winkle" story. In 1977, Mr. Pickwick Records released an album (SPC-5156) with Boris Karloff narrating a version of the story along with a version of The Legend of Sleepy Hollow. Numerous modern songs have been written whose lyrics retell the story, including the 1961 song "Rip Van Winkle" by The Devotions, the 2006 song "Rip Van Winkle" by Witch, and "Kaatskill Serenade" by David Bromberg. In the Belle and Sebastian song "I Could Be Dreaming" an extract from "Rip Van Winkle" is read. The cartoon, Have You Got Any Castles? (1938), depicts Rip Van Winkle trying to fall asleep in a cuckoo clock. In the animated short Popeye Meets Rip Van Winkle (1941), the soundly-sleeping Rip is evicted for not paying his rent for twenty years, and features a caricature of Chico Marx playing the piano. In the 16th episode of The Famous Adventures of Mr. Magoo (original airdate January 16, 1965), Mr. Magoo (voiced by Jim Backus) plays Rip Van Winkle. The story inspired an episode of The Flintstones entitled "Rip Van Flintstone", which originally aired on November 5, 1965. In it, Fred falls asleep at the Slate Company picnic and dreams he has awakened 20 years in the future as an old man. He notices various changes to his town of Bedrock and to his friends. Fred remarks that, "Maybe I have fallen asleep for 20 years like in that Rip Van Winklestone story." The story was parodied in an episode of the Laurel and Hardy cartoon series entitled "Flipped Van Winkles". Tales of Washington Irving, a one-hour animated television special from 1970, presented adaptations of "The Legend of Sleepy Hollow" and "Rip Van Winkle". Rip Van Winkle (1978), a claymation version of the story produced and directed by Will Vinton, was nominated for an Academy Award for Best Animated Short Film. An episode of the HBO show Happily Ever After: Fairy Tales for Every Child gives a feminist retelling of the story as told from the point of view of Rip's wife Vanna. The adaptation, starring Tom Arnold and Calista Flockhart and co-narrated by Gloria Steinem, is set in the 1960s, where Rip is a heavy metal rocker who often neglects his wife and child. Issue 12 of Classics Illustrated retold the "Rip Van Winkle" story with various twists. In the Carl Barks comic Rip Van Donald (1950), Donald Duck's nephews trick him into believing that he has been sleeping for 40 years, and has supposedly awakened in the then-future year of 1990. Donald expects to see a fabulous "futuristic" world, and the nephews must use various tricks to keep their prank going. Eventually Donald falls asleep and "returns" to 1950. Disney's "Rip van Goofy" (February 1, 1966) is a parody of "Rip Van Winkle", with Goofy portraying the character who sleeps for 20 years. When he awakens, no one remembers him except Mickey Mouse, once a child to whom Rip van Goofy told fantasy stories. In a 1988 issue of Boys' Life, the Dink & Duff comic strip has the African-American Cub Scout Dink pondering the meaning of Americanism, only to lapse into a coma and awaken in 2068. A boy who addresses him as "Rip van Dinkle" explains that during the past 80 years the United States has been replaced by an authoritarian monarchy. Dink eventually awakens back in 1988. The story was adapted twice for Kraft Television Theatre, once in 1950 with Lawrence Fletcher and once in 1953 with Raymond Bramley. E. G. Marshall played the title character in a 1958 episode of Shirley Temple's Storybook. The TV show Wishbone showed the dog imagining himself as the title character, complete with the men playing nine-pins and his mistaking the George Washington Inn for his old hangout, the King George Inn. Harry Dean Stanton played the title role in the 1987 Shelley Duvall's Tall Tales and Legends episode directed by Francis Ford Coppola. A poem by Carol Ann Duffy - Mrs Rip Van Winkle, narrates the poetry from the perspective of Mrs. Winkle. The Rip Van Winkle Bridge spans the Hudson River near Catskill, New York. Old Rip Van Winkle is a brand of Kentucky Straight Bourbon whiskey produced by the Sazerac Company. Pappy Van Winkle's Family Reserve is the flagship brand of Bourbon whiskey owned by the "Old Rip Van Winkle Distillery" company, actually distilled and bottled by the Sazerac Company. A character in the novel Darkness at Noon (1940) is nicknamed Rip Van Winkle because he spent 20 years imprisoned in solitary confinement. The American composer George Whitefield Chadwick wrote a concert overture entitled Rip Van Winkle in 1879, when he was a student in Leipzig. Composer Ferde Grofe spent 20 years working on a symphonic tone poem based on "Rip Van Winkle", eventually reworking the material into his Hudson River Suite. One of the movements is entitled "Rip Van Winkle". American musician Josh Eppard, rapping under the name Weerd Science, references Rip Van Winkle in his song, "Sick Kids". In the chorus of the song, Eppard sings "I tried to tell you that these kids are sick, man. Leave you sleeping in the dirt like your name was Rip Van." "Mountain Music" is a song written by Randy Owen, and recorded by the American country music band Alabama. It was released in January 1982 and references Rip Van Winkle in the lyrics of the song, "Take a nap like Rip Van Winkle." Ween's song "Sketches of Winkle", from 1991, also alludes to the story. Laura Carrington aspiring actress mentions Rip Van Winkle in Lionel Ritchie's 1984 music video Hello. In Belle & Sebastian 's song I could be dreaming a piece of the story is read out loud. In an episode of The Twilight Zone entitled, The Rip Van Winkle Caper (season 2, episode 24, original airdate April 21, 1961), four gold thieves place themselves in suspended animation for 100 years in order to escape the law and, upon revival, spend their stolen fortune with impunity. Complications arise in the form of a Rod Serling plot twist. The manga/anime series Hellsing has a minor antagonist named Rip Van Winkle. In the 2018 Video Game Red Dead Redemption 2 the character of John Marston is asked who he is by a member of the Pinkerton Detective Agency. He responds sarcastically, stating that he's Rip Van Winkle. ^ Pierre M. Irving, The Life and Letters of Washington Irving, G. P. Putnam's Sons, 1883, vol. 2, p. 176. ^ Burstein, Andrew (2007). The Original Knickerbocker: The Life of Washington Irving. New York: Basic Books. p. 117. ISBN 978-0-465-00853-7. ^ Jones, Brian Jay (2008). Washington Irving: An American Original. New York: Arcade Books. p. 168. ISBN 978-1-55970-836-4. ^ a b c Burstein, Andrew (2007). The Original Knickerbocker: The Life of Washington Irving. New York: Basic Books. p. 125. ISBN 978-0-465-00853-7. ^ Jones, Brian Jay (2008). Washington Irving: An American Original. New York: Arcade Books. pp. 168–169. ISBN 978-1-55970-836-4. ^ Burstein, Andrew (2007). The Original Knickerbocker: The Life of Washington Irving. New York: Basic Books. p. 120. ISBN 978-0-465-00853-7. ^ Jones, Brian Jay (2008). Washington Irving: An American Original. New York: Arcade Books. pp. 177–178. ISBN 978-1-55970-836-4. ^ Burstein, Andrew (2007). The Original Knickerbocker: The Life of Washington Irving. New York: Basic Books. pp. 149–150. ISBN 978-0-465-00853-7. ^ a b c Rothschild, Clare K. (2014). Paul in Athens: The Popular Religious Context of Acts 17. Tübingen, Germany: Mohr Siebeck. pp. 40–42. ISBN 978-3-16-153260-3. ^ a b c Hansen, William (2017). The Book of Greek & Roman Folktales, Legends & Myths. Princeton, New Jersey: Princeton University Press. pp. 132–133. ISBN 9780691170152. ^ Welch, Deshler (9 May 1887). The Theater. 3. New York City, New York: Theatre Publishing Company. p. 139. Retrieved 21 June 2017. ^ a b c d Thorn, John. "Saint Rip". nyfolklore.org. Voices: The Journal of New York Folklore. Retrieved 21 June 2017. ^ Bates, Alfred (1906). The Drama; Its History, Literature and Influence on Civilization: American Drama. 20. London, England: Historical Publishing Company. p. 121. Retrieved 21 June 2017. ^ "Surat Al-Kahf (18:9-26)". The Holy Qur'an – القرآن الكريم. ^ A translation of the tale is available on Wikisource: Peter the Goatherd. ^ Gioia, Joe (2013). The Guitar and the New World: A Fugitive History. State University of New York Press. pp. 188–191. ISBN 978-1-4384-4617-2. The story of the young hunter and the Great Little People, whose single night is that of a human year, became Irving's satire on progress and a portrait of the fundamental strangeness of change. ^ "Muchukunda". Mythfolklore.net. October 16, 2007. Retrieved October 30, 2013. ^ "Srimad Bhagavatam Canto 10 Chapter 51". Vedabase.net. Archived from the original on 2013-10-12. Retrieved 2013-10-30. ^ a b c Jefferson, Joseph; Boucicault, Dion (1895). Rip Van Winkle (Introduction). Dodd, Mead and Company. pp. 401–403. Retrieved 23 May 2017. ^ a b c d e f g h Hischak, Thomas S. (2012). American Literature on Stage and Screen. Jefferson, North Carolina: McFarland and Company. pp. 197–198. Retrieved 23 May 2017. ^ "IMDb Pro : Rip Van Flintstone Business Details". pro.imdb.com. July 27, 2007. Retrieved October 30, 2013. ^ "Will Vinton's Personal Website". Willvinton.net. Retrieved 2013-10-30. ^ "Rip van Goofy". Walt Disney's Comics and Stories (5). Gold Key. 26 (305). February 1, 1966. ^ Moore, Scott (November 5, 1995). "In Dogged Pursuit of Literacy". The Washington Post. Retrieved 26 March 2017. ^ Mendoza, Manuel (October 8, 1995). "Tales Wag `Wishbone' To Lure Kids To Classics". The Sun Sentinel. Retrieved 26 March 2017. Irving, Washington. Rip Van Winkle. Bartleby (e-book ed.). Irving, Washington (1946). Rip Van Winkle. KiddieRecords (Audiobook ed.). Archived from the original on 2007-06-29. Retrieved 2007-05-27. "'Rip Van Winkle' and 'The Legend of Sleepy Hollow' – Irving's Fictions of Revolution". cowbeech.force9.co.uk. "'Rip Van Winkle' Study Guide". Cummings Study Guides. "Washington Irving in Birmingham". Birmingham.gov.uk.